The Quantum 2 is the ultimate high density hair removal machine. The key to pain free hair removal is to get sufficient energy (heat) into hair follicle before it has had time to escape and then STOP. The Quantum 2 can do this because it can supply an incredible 60J/cm2 in 40ms and keep on supplying this level of power throughout the working day due to its excellent cooling system. 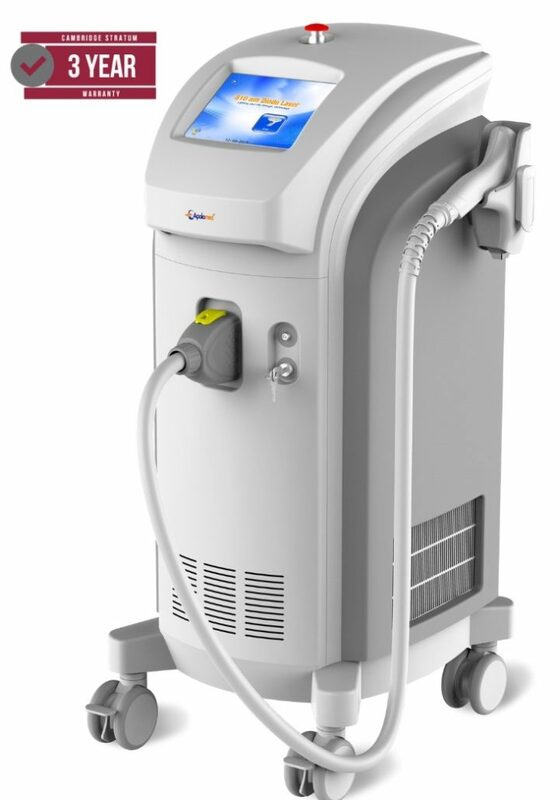 The Quantum 2 is also a heavy duty Quantum hair laser well suited to intense use. A quantum is a discrete package of energy and that is fundamental to how our Quantum range works. The key to pain free hair removal is to quickly deliver just the right amount of energy to the target and then stop, while at teh same time cooling the epidermis. a) Delivering a single long pulse, even with head cooling was painful due to the leakage of heat into the surrounding tissue. b) Multiple pulse modes of operation such as SHR reduced the pain by raising the temperature of the surrounding tissue to just below the pain threshold using a series of short pulses with the intention that the final short pulse would be enough to damage the hair follicle without overheating the surrounding tissue. The problem with this approach has been the small energy within each pulse. e.g. 8J/cm2 at 30ms. This gave good results on dark hair in light skin but was less effective on lighter/finer hair. Where the new Quantum range wins is in the ability to deliver for instance 30J/cm2 in 30ms. Or indeed 20J/cm2 in 20ms, which is equivalent to the Thermal Relaxation Time of quite fine hair. Therefore since there is little time for the heat to escape from the follicle, the follicle temperature rises, while the surrounding translucent tissue remains relatively cool. This enables it to reach a high enough temperature to denature the protein in the follicle. Then as the name “Quantum” implies the energy delivery is stopped. The energy continues to escape from the follicle but as it does the temperature drops because there is no new energy flowing in. The net result is that the hair follicle has been damaged while the surrounding tissue remains relatively cool. But if so much energy is being delivered so quickly why does that not make the surrounding tissue hot? Modern diode lasers are equipped with cooled sapphire windows through which the beam passes. These windows are kept at a temperature just above freezing to prevent ice formation but they do cool the skin surface effectively and since the epidemis is only around 100um thick it cools the basal layer and all it contains including melanocytes and nerve sensors. The beam then continues on into the translucent tissue where the heat is dissipated over a much larger volume of tissue that has no pain sensors. In the older generation of diode lasers it is the heat trapped by the hair follicle and then conducted into the surrounding skin that adds to the incident heat and can result in pain. That element is virtually eliminated in the Quantum method to give pain free, predictable results. All of our diode stacks are made to the same high quality and are imported from the USA where they are precision assembled using automated machines to ensure consistency and accuracy. Experience has shown that this is the only way to ensure a long diode life and is part of the Cambridge Stratum no compromise commitment to product quality. The Quantum range are high density lasers which means that they concentrate the light energy and can delivery for instance 30J/cm2 in 30ms. This is a combination of high peak power and concentrated light energy.